The annual SSAA Program Symposium took place in Albuquerque, NM from June 27-28, 2013. Individual grant recipients and center directors from the three divisions of the program (High Energy Density Physics, Low Energy Nuclear Science, and Materials Properties Under Extreme Conditions) gave updates on center or group activities and progress. The symposium was opened with a welcome address from Ralph Schneider, the Director of the Office of Defense Science at the NNSA. Paul Hommert, Director of Sandia National Laboratories, gave the keynote talk before the poster session. 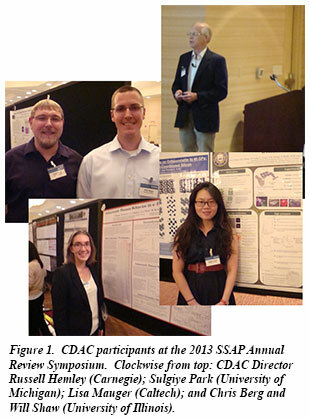 CDAC students and partners were joined by two CDAC and HPCAT scientists and presented 18 posters during the poster session on the first night of the symposium. CDAC Director Russell Hemley gave two invited talks, one an overview of CDAC and one with Yogendra Gupta (Washington State University) on unique opportunities at the Advanced Photon Source, featuring HPCAT and DCS. CDAC Students Pamela Kaercher (Berkeley), Zeyu Li (University of Michigan), Lisa Mauger (Caltech), and Eloisa Zepeda-Alarcon (Berkeley) all received Best Poster awards during the poster session. This is the second year in a row that Pamela has earned this honor.